Phragmites australis is a perennial C3 grass (Mal and Narine 2004; Kresovich et al. 1982) to 4 m tall; extensively colonial, dense monocultures from thick rhizome mats; rhizomes usually over 1.5 cm wide, generally oval in cross section; stems stout, erect, tough and rigid, gray-green, winter stems persistent, tan, texture of stem under leaf sheath is rough, finely ribbed (use lens), (Blossey 2002). Leaves with blade to 3 cm wide; leaf sheath difficult to remove, upper sheaths and blades very persistent in winter. Flower Spikelets 3-7 flowered, often dark purple in bloom, becoming whitish, very hairy, in fruit; inflorescence dense, becoming plumed, 20-40 cm long, persistent into late winter; blooming and fruiting Aug.-Sept. Origin: Europe. Some genotypes are native to North America but apparently all plants in the NYC area are of an invasive European genotype (Haplotype). This genotype now found almost worldwide (Saltonstall 2002). Habitat: Wet to tidally flooded open areas, soil pH 4.5-8.7 (USDA, NRDC 2010), prefers high nutrient soil. In NYC found in soil with pH 5.6-7.0 (Gargiullo, Kruzansky and Larson unpublished data). Tolerates anaerobic soil for some periods of time (Mal and Narine 2004), brackish water and many pollutants, formerly connected tidal wetlands, brackish marshes, freshwater marshes collecting gray-water runoff, high nutrient, moist fill; rhizomes tolerant of fire; intolerant of shade. Shown to take up heavy metals in shoots and roots as well as by co-precipitation in iron compounds on root surfaces (Ye et al. 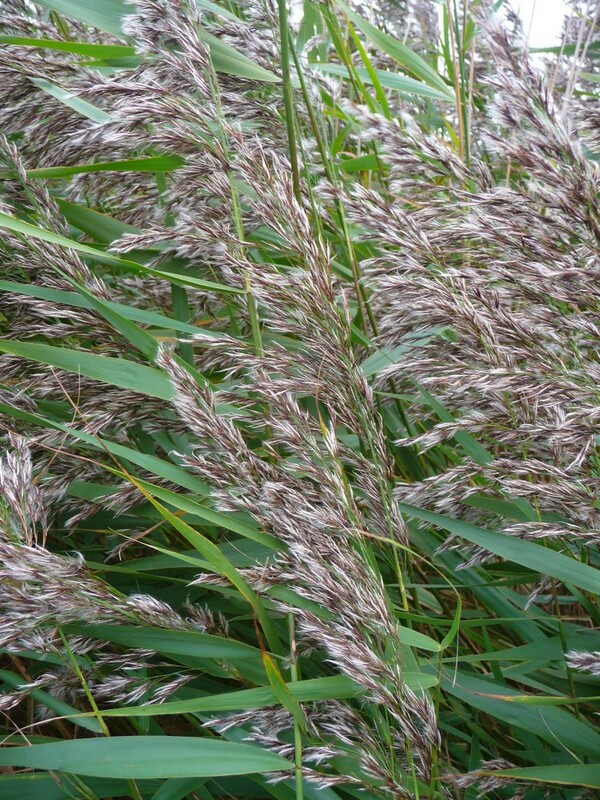 1997), Intolerant of fully saline, ocean water However, Phragmites may tolerate on the order of 20 ppt salt. (Haslam 1970, 1971; Kiviat 1994; Kudo and Ito 1988; Thompson and Shay 1985; Lapin and Randall 1993). Notes: Rhizomes eaten by muskrats (Martin et al 1951). Fed upon by few insects and infected by few fungi in North America (Mal and Narine 2004). Excludes other vegetation, except for small “understory” plants on unflooded sites. Promoted by burning in spring or fall, summer burning may retard growth. Controlled or eliminated by about a 2 ft. layer of sand on upland sites, or by increased tidal flushing on marshy sites. 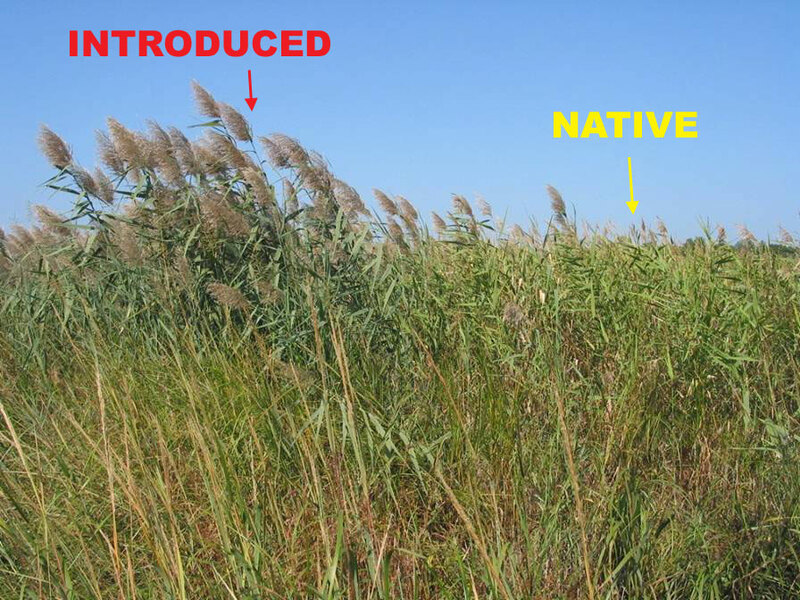 It has been suggested that in urban areas the combination of increased nitrogen and phosphorus from combined sewer outfalls (CSOs) and other runoff sources, along with increased calcium from runoff over concrete, as well as concrete dust from massive amounts of infrastructure, may significantly increase the salt tolerance of Phragmites. Listed as one of the “top twenty” invasive alien plants by the NYS Natural Heritage Program’s Ad hoc committee on invasive plants. Efforts now underway to detail structural morphological differences in native and non-native genotypes. To date, no native colonies have been found in NYC, although they exist in MD, northern VA, southern NJ and Cap Cod MA (Payne and Blossey 2007; Meadows and Saltonstall 2007). Native plants, Phragmites australis subsp. americanus Saltonstall, differ from introduced plants (haplotype M), being smaller than the introduced Phragmites, in having upper leaf sheaths that fall off or are easily removed by late Autumn, upper stems are often red during summer, stems under sheath are smooth and shiny, stems often crooked, inflorescence sparse, blooming July-Aug.; colonies sparse, from rhizomes less than 1.5 cm wide, usually round in cross section (Blossey 2002). Colonies of native Phragmites seem to be found in places with less disturbance than colonies of introduced Phragmites (Meadows and Saltonstall 2007).